This book is ostensibly concerned with the social problem of youth homelessness, and yet in this chapter we consider three quite different social issues — AIDS, child abuse and domestic violence against women. Why is a chapter about these issues included in a book about youth homelessness? In short, we are introducing these three themes to highlight some of the common elements that can be found in all social welfare issues. We have already seen how youth homelessness is variously interpreted and presented by different categories of people, such as the media, agencies, politicians, academics and by young homeless people themselves. We have also considered in relation to youth homelessness the importance of definition, measurement and explanation, as well as setting out the range of suggested solutions. We will now show how three quite different issues can usefully be considered from a similar perspective. 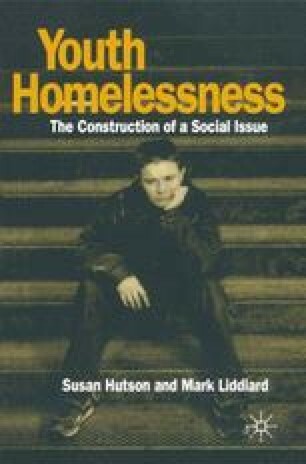 In this way, we hope to illustrate that many of the observations that we have made about the construction of youth homelessness as a social problem also apply to other social issues.